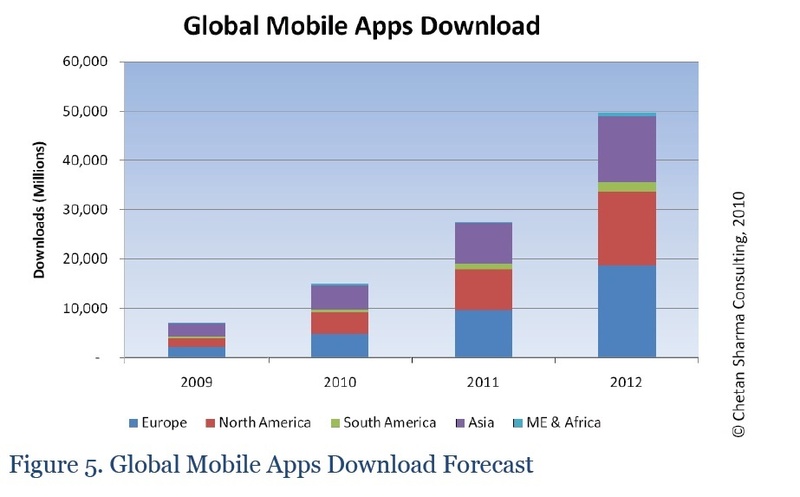 With the huge growth in the smartphone market over the past few years, mobile apps have become seriously big business. Apple’s CEO, Steve Jobs, just recently announced that the iTunes app store had passed 5 billion downloads at the 2010 Apple Worldwide Developers Conference (WWDC). What probably isn’t as well known is that GetJar, an open-platform app store also just reached their own impressive milestone – 1 billion downloads. GetJar is the world’s second largest app store by volume, second only to Apple. Over 65,000 apps are currently available from GetJar across a number of platforms inluding Android, Blackberry, Windows Mobile and Symbian. It’s no secret that app sales have been accelerating, and if an independent report commissioned by GetJar is anything to go by, mobile app sales look set to continue to soar – with projected sales volumes in the range of $17.5 billion by 2012. That’s almost $4 billion more than projected worldwide CD sales in 2012 ($13.83 billion).